Add a unique look to your Volkswagen New Beetle! 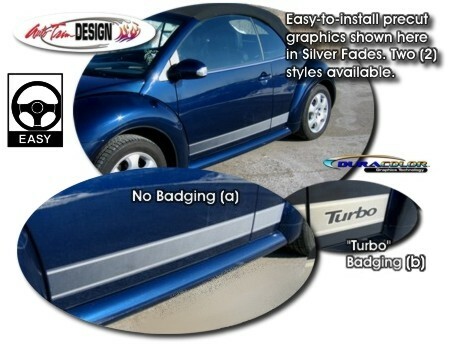 These awesome body side graphics are designed to fit perfectly on your Beetle's lower door panel area as shown. Starting as a light fade at the front with a solid stripe at the top and bottom, the 4" (10.16cm) wide stripe gradually darkens to the rear. Available in four (4) colors (Silver shown) and two (2) unique badging designs as shown - your choice. These graphics are precut (no trimming required) and very easy to install. This graphic kit will fit any '98-Current New Beetle. Easy to follow general online application and care instructions are included.